Before I became a member at California Family Fitness, I felt tired and depressed all of the time, and I was winded going up a flight of stairs. My right knee would swell with the pressure of my weight and sometimes I needed to walk with a cane. I needed to buy new pants; my large pants were no longer fitting, even the ones with an elastic waistband. I was tired of the way I looked and felt and wanted to lose the extra weight. I was invited to a friend’s vacation home in Mexico this coming November and I decided I was going to be trimmer and have a more athletic physic, and this gave me six months to reach that goal. I started working out on my own doing what I knew and begin to slowly see some results. The opportunity for me to work with a professional trainer for one session was offered and I decided to go with an open mind. I found the training was thoughtful and thorough and the club’s Fitness Manager, Jason Newman was listening to me and my needs as I had concerns about my knee. Based on the session with Jason I decided to align my goals with my actions and I bought a package of half hour sessions - best decision I have made in a long time. The 30 minute option fits in well with my lunch schedule. I began working with Jose Serrano and he has consistently challenged my abilities and continues to motivate me towards my goals. There are times I feel like I cannot give anymore and Jose is right there with me to push me though my own self-imposed limitations. 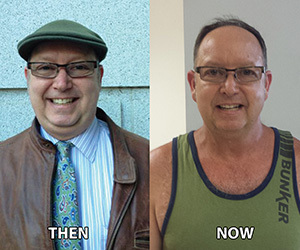 I have made more gains in both muscle mass and weight loss than I ever thought possible. I feel better than I have in years. I have dropped about 25 pounds since starting my work with Jose, and I have a goal to drop 15 more within the next two months. My motivation and mood have improved. I take the stairs at work. I now feel accomplished and younger, two feeling that have been challenging (and exciting) for me to experience.